The Armstrong that never was - The 726. Once the 600 range was well into production, Armstrong began research and development on their intended next range – for obvious reasons called the 700 range. The initial assumption was that this would build on what they had learned from the 600. At the time Armstrong always included a ‘customer feedback’ card to be returned with the warranty registration. They then studied the comments and replies to try and ensure new designs would incorporate any features or changes that people would find desirable. 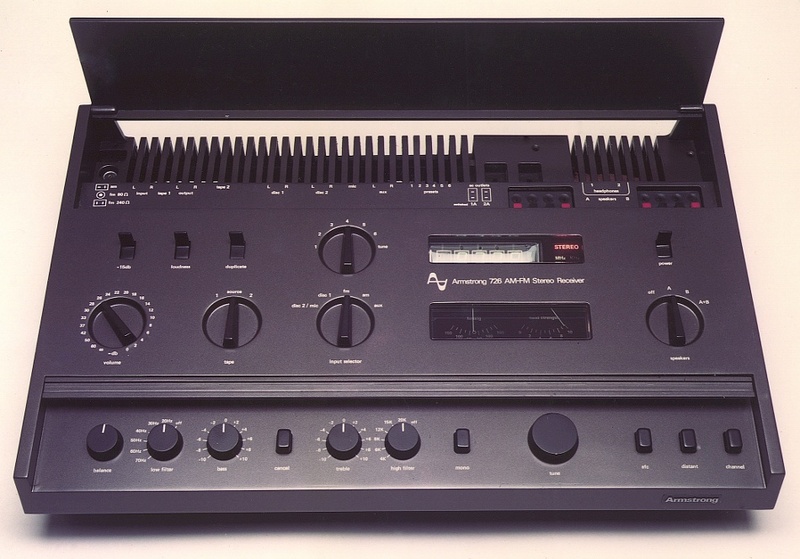 At the time Armstrong’s most popular units were the 625 and 626 tuner-amps (receivers). Barry Hope and John Twydell then did a ‘mock up’ design model to show to people along with a list of specifications to get their reactions. The result was the 726 Receiver. The above photo shows the model of the 726. This was to include a 70 Watts per channel amplifier and a varactor-tuned tuner. 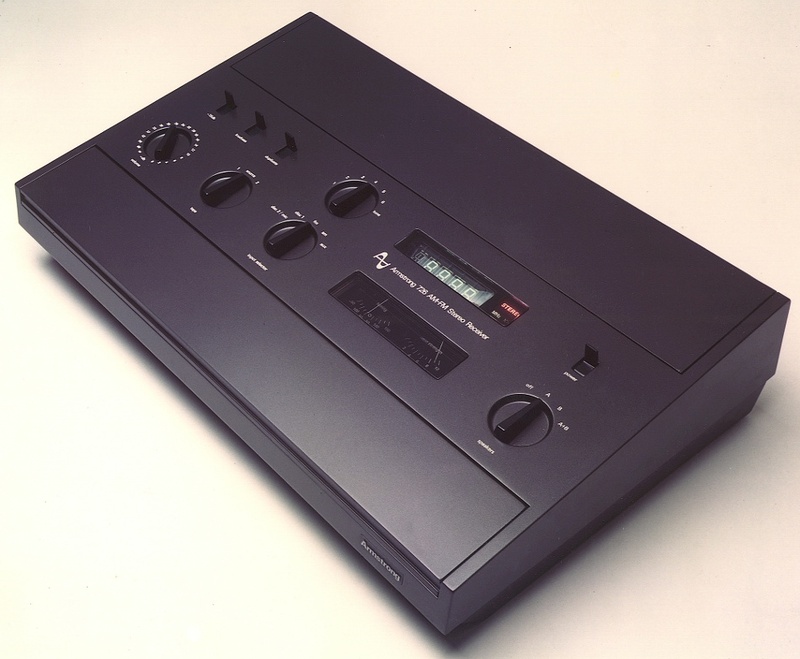 It had two tape outputs and could monitor or dub between tapes whilst the user listened to something else. It had outlets for two sets of speakers and two pairs of headphones. It also had two RIAA inputs so the user could have two systems for playing Vinyl discs and switch between them. During the 1970s and 80s home audio was increasingly being expected to fulfil two roles which tend to conflict. On the one hand the equipment was expected to be flexible and offer many facilities. On the other it had to look neat and tidy and fit into the home decor. The problem was (and still is for modern designers!) that technical flexibility and multiple facilities tends to mean a need for lots of buttons and knobs and dials. Which can look cluttered and bewilderingly off-putting. The 600 range had dealt with this clash by using a horizontal row of ‘piano key’ buttons along its front. These were styled to ‘vanish’ when viewed across the room since you were looking at thin black buttons against a black background facia. The 726 was intended to had more facilities than the 600s, but the aim was for an even simpler and clearer appearance. So it was decided to hide many of the features behind panels. In daily use, listening to radio or LP, all the complications would be out of sight. The above photo shows the unit in that ‘clean’ state. cancel button that bypasses all the tone controls and filters. These days audio purists tend to scorn the use of tone controls, etc. But in practice they can be vary useful when faced with something like the widely varying recorded balances of different LPs. 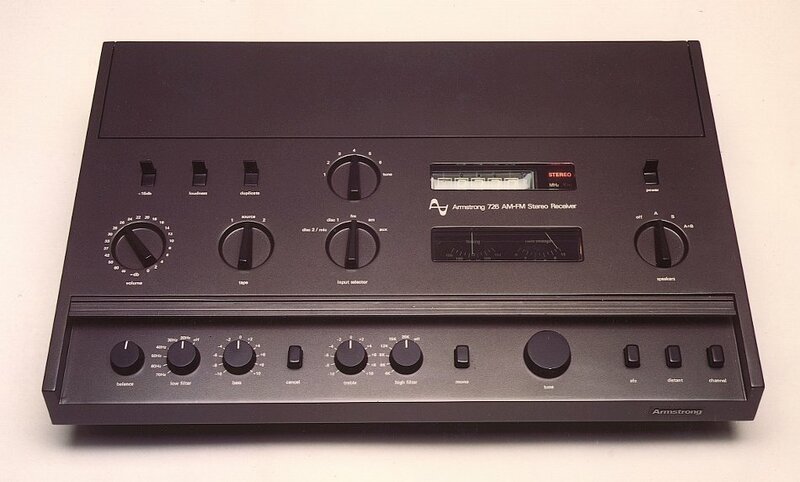 At the time the 726 was conceived it was clear that Armstrong customers wanted tone controls, and filters. The mono button was useful for old mono LPs and when FM reception made stereo noisy. The distant button adjusted the sensitivity of the tuner, and the channel button altered the IF bandwidth. These let the user select whichever options most suited their reception conditions. The tuner was to be a varactor tuned design. From the user’s point of view this would have behaved like the one used in the 600 range. There were five presets (adjusted at the back) plus manual tuning. The long-wave and medium-wave bands were to be covered in one wide-tuning AM band. Ted Rule spent some time developing a novel FM tuner to be based on helical resonators to obtain outstanding performance. But as with other Armstrong technological approaches like the double-conversion and diode input switching of the 600 tuner, this would have been simply used without much fuss. The user should simply have noticed that it worked well. The tuned frequency was to be shown on a ‘digital’ display, but the then-conventional tuning meters were also provided. The photo above shows the 726 with both the front and back flaps opened. This also exposes the heatsinking for the power amplifier output stages. With the 600 the heatsinks had to be tiny in order to be hidden and not spoil the visual design. On the 726, the back flap gave much more scope for larger heatsinks to suit the higher intended power and loudspeakers that became more current hungry during the 1980s!